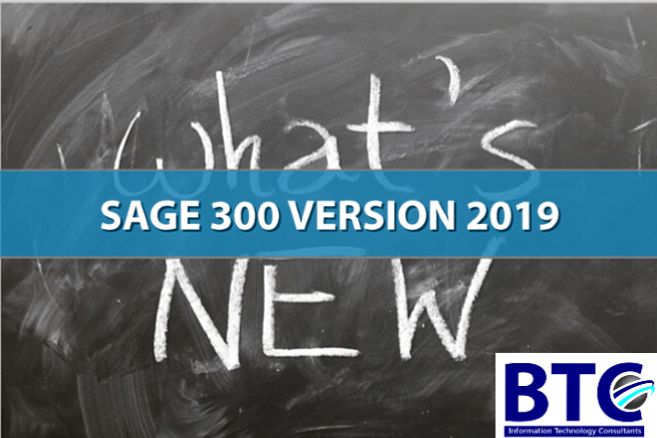 What is new in Sage 300 ERP 2019 UAE? Sage 300 in UAE has released its new version with improved and better features that drive your business operations significantly more now. Yes, Sage 300 2019 has come with some new options to make things a lot better than ever. Global Search – Type a name, description, number, or code in Global Search to find transactions or records across your entire database. You can search for people, companies, transactions, accounts, and many other types of records. Export Declaration Number Field – In A/R and Order Entry, you can now enter export declaration numbers for individual invoice details which are required for tax purposes in some jurisdictions. Modernized Technical Architecture – Several older technologies within the Sage 300 ERP Dubai architecture have been retired and replaced, improving performance, scalability, and security. The way that Sage CRM integrates with Sage 300 has been totally redesigned to make it easier to set up and to improve usability and performance. Integration screens now have the same modern look and feel like web screens and perform faster too. The integration now uses the Sage 300 cloud web screens instead of the old Sage 300 Portal which not only makes installation much simpler but also enhances screen functionality and customization capabilities. Customers must be on Sage 300cloud in order to use integrated Sage CRM with Sage 300 2019.0 and later versions. Sage 300 has introduced a new feature called Global Search with its latest release of Sage 300 ERP 2019. This feature helps the user to quickly search for the data (transactions) from the company database. “Refine Search By” section has a tree like structure to specify the area for searching the content from the database entered in the search box. Search results will be displayed in the right section of “Refine Search By” with the navigation path to the screen and related summary information. The biggest reason to upgrade your software is so that you are on a current version of the software and you are not putting your company at risk with being on outdated software. The product and payroll tax updates are only released for those versions that are current. There is also additional functionality that comes updated with the upgrade software such as web screens, notes and other little fixes that improve your system. Sage 300 In Dubai, your accounting system, is the foundation of your business and must be solid first, before improving other operations around it. Need Sage 300 Support or Help Upgrading? If you want to make your business operations run smoothly and upgrade Sage 300 ERP UAE then contact our experts.